Home / Health / Is alcohol really that bad for your health? Is alcohol really that bad for your health? The new ‘safe’ level of alcohol consumption should be none, at least according to a recent study into the health risks of alcohol published by the The Lancet. This contradicts the current official government guidelines on the ‘safe’ level of drinking: currently around 14 units per week for women, and 21 for men. The Daily Mail reported that ‘just one glass of wine a day increases your risk of various cancers’. Even The Independent reported that ‘the idea that one or two drinks a day is good for you is a myth’. 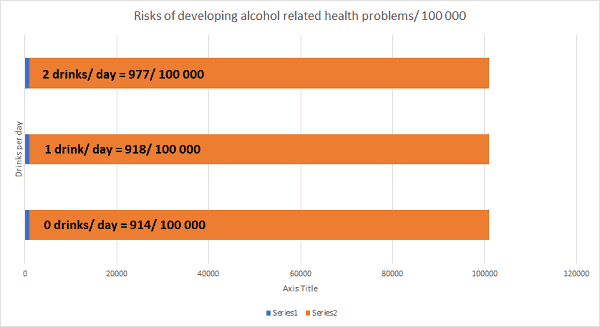 But what are the actual statistical risks of different levels of alcohol consumption? I took the liberty of putting this into graph form to illustrate the relative risks: blue shows the proportion of people who will develop alcohol related problems! This means that statistically, there is only a 0.5 % greater risk of developing an alcohol related illness if you have one drink a day compared to no drinks, which hardly sounds significant! Meanwhile, there is a greater increase in risk if you have two compared to 1 drink a day, which suggests the government guidelines have got this about right! So why did some news papers report these findings in a limited way? This could be a classic example of News Values determining how an event gets reported: it’s much more shocking to report that the government has got its advice wrong and that really there is no safe level of drinking! Or it could be that these newspapers feel as though they’ve got a social policy duty to the general public… even if there is only a slight increased risk from alcohol consumption, maybe they feel duty bound to report it in such a way to nudge behaviour in a more healthy direction. In terms of why some newspapers did a better job of reporting the actual findings: it could be that these are the papers who rely on advertising revenue from drinks companies? Maybe the Mail and the Independent don’t get paid by drinks companies, whereas Sky does>? This post will also be published to the steem blockchain: where you can get rewarded in crypto currency for posting, liking, commenting and so on! Previous post: Religious Pluralism: Evidence of Secularization?